AP reports that a Fagus sylvatica 'Purpurea', or purple beech tree, planted in 1786 at Versailles Palace for Marie Antoinette has been felled by a storm. The 82-foot high specimen, whose canopy measured 72 feet across, will be cut up and sold to paper makers. 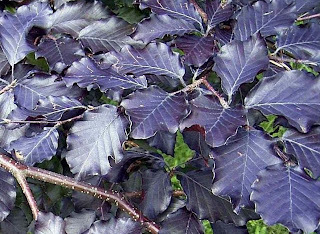 I love just about everything about beech trees, from their smooth muscular bark to the undulating leaf margins, and the purple-leaved variety is particularly handsome. Unfortunately, in places like Palo Alto and Los Altos I rarely have the chance to specify such large and thirsty trees, which are much better suited to riparian areas with cooler, wetter summers (like, you know, Atherton). On the other hand, if I were king, I suppose I wouldn't be burdened by such practicalities. If the Sun King and his progeny lived and landscaped a Bay Area version of Versailles today, I wonder what species they would choose?